Felicity Jones just uttered one of the most famous phrases of the "Star Wars" franchise — heck, of almost any franchise: "May the Force be with you." Jones' Jyn Erso tweaks the phrase to say "us" in a new behind-the-scenes reel for "Rogue One: A Star Wars Story." In the scene, she likely leads a band of Rebel Alliance fighters to try to steal the plans to the Death Star. But first, they have to pass these Stormtroopers. Lucasfilm released the reel Friday at Star Wars Celebration, an annual event celebrating all things "Star Wars." 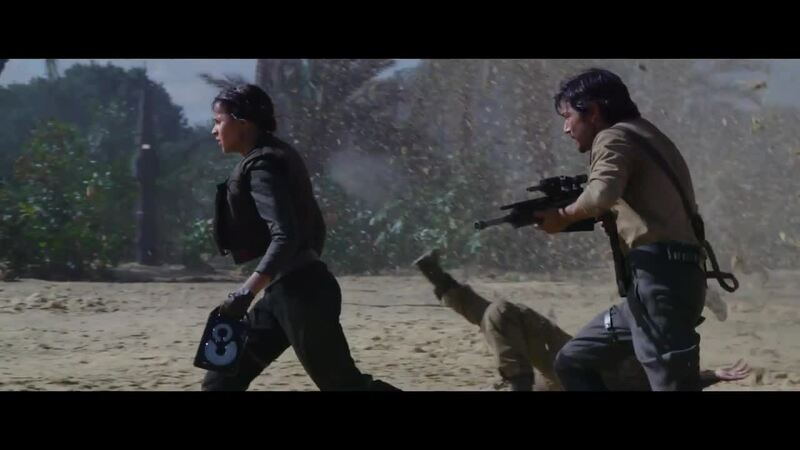 If there's one takeaway from the clips, it's that there sure will be a lot of explosions in "Rogue One." What might be the most reassuring about the peek at the film is how it shows off real effects on sets versus primarily using green-screen effects (looking at you, prequels). The director Gareth Edwards also comments on the necessity of taking risks even when adding to a much-beloved franchise like "Star Wars." He might have just explained why those reshoots happened. Also at Star Wars Celebration, Lucasfilm unveiled this awesome new poster for "Rogue One." If anything, the shoot looks pretty intense. Watch the full clip above.